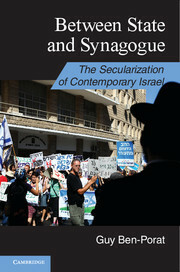 This December, Cambridge University Press will publish Between State and Synagogue: The Secularization of Contemporary Israel by Guy Ben-Porat (Ben-Gurion University). The publisher’s description follows. A thriving, yet small, liberal component in Israeli society has frequently taken issue with the constraints imposed by religious orthodoxy, largely with limited success. However, Guy Ben-Porat suggests, in recent years, in part because of demographic changes and in part because of the influence of an increasingly consumer-oriented society, dramatic changes have occurred in secularization of significant parts of public and private lives. Even though these fissures often have more to do with lifestyle choices and economics than with political or religious ideology, the demands and choices of a secular public and a burgeoning religious presence in the government are becoming ever more difficult to reconcile. The evidence, which the author has accrued from numerous interviews and a detailed survey, is nowhere more telling than in areas that demand religious sanction such as marriage, burial, the sale of pork, and the operation of businesses on the Sabbath.